Are you stuck in a tough season of parenting? Do you keep finding the pitfalls but need something to get you through? I understand. Sometimes seasons of parenting are harder than others. Whether this season is hard because of health concerns, financial strain, difficult circumstances affecting your family, experiencing heartache or loss, or just the stresses of ages and stages and all that comes with it—you may feel like you won’t make it through. Take heart. This is just a season and there is hope. I would love to share with you ten things to avoid in the tough seasons of parenting and what you might embrace instead. Whether you are just starting your parenting journey or 23 years in like I am, you are bound to experience tough seasons of parenting! (Yes, some things don’t necessarily get easier the more you do them! J ) Don’t let that discourage you! Just know it is par for the course. That means you are normal. You are not crazy, and it is to be expected. I look back on my 23 years of being a mom, and I know I have experienced some pretty gut-wrenching and difficult seasons. Times that brought me to my knees, flipped me to the floor or landed me on my back for some time. But I am not sure I have ever felt the overwhelm of the past few weeks like I have. In fact, this last week has about killed me! 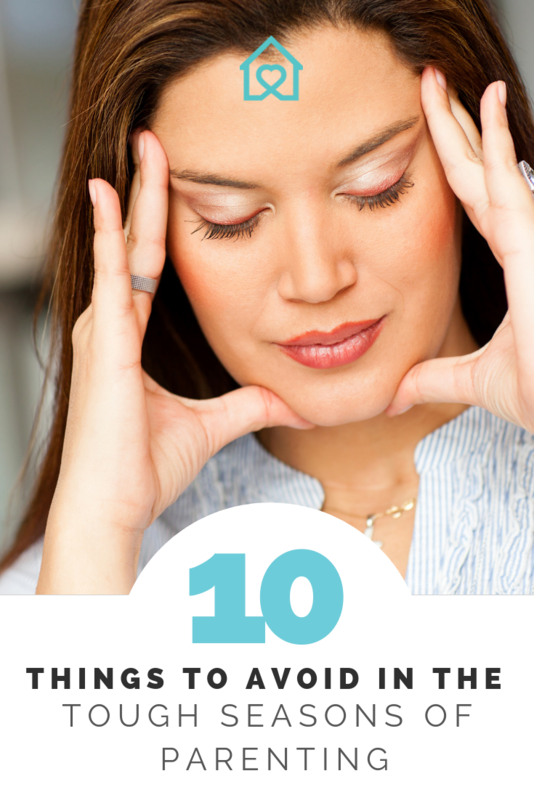 So as I sit down to write today, I’m digging deep into my well of resources and reminding not only you but myself as well, of these Ten Things to Avoid In the Tough Seasons of Parenting. Yes, sometimes in this journey we have to simplify and remind ourselves where we can and cannot go! I wish I could say I had conquered these all, but instead, I invite you today on this personal pep talk and refresher on choosing where to fall! This past couple of weeks have felt challenging to say the least to our family. It seems we have gone from one setback, discouragement, or frustration to another and just keeps making rounds. 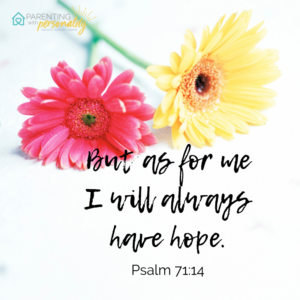 We have seven kids and at the present time, not one of them is without a significant or unexpected event that has caused them hurt, pain, worry, or fear. My mother’s heart feels about to explode with the anxiety, worry, and pressure of the numerous situations. 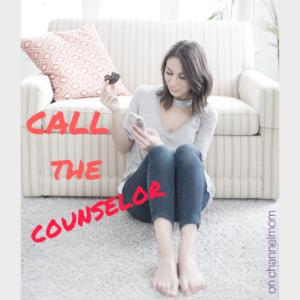 Some of the situations revolve around difficult relationships (teachers, coaches, friends, or peers), bullying, health concerns, personal disappointments, unexpected challenges…you get the idea. I don’t think we are the only ones feeling the crunch of busy schedules, unrealistic expectations, unfair treatment, health challenges, upcoming surgeries, hurt or pain. And I am very aware that our trials probably seem small compared to what others may be facing. But regardless, it can be helpful to stop and determine how you are going to handle the tough season you are in. As I look on the past few weeks, with moments that have taken my breath away (no, not in the good way, but rather in the punched in the gut way! ), I am convinced of the need to pause and truly choose what I will avoid in this season and what I will embrace. It is so easy, in the midst of hardship and trial, to look around and see all the people faring well! So-and-so over there has never had it rough. How come things always go easy for them? Then without much thought, we slide down this dark hole of comparison and feel as though our lives are unfairly plagued by things we can’t handle. But perhaps there are people out there that have it worse than what we are experiencing. And perhaps, even those we think have it easy may indeed be experiencing things we wouldn’t imagine or know. Maybe just knowing that a fair dose of compassion is needed will help us in the journey and is probably a whole lot more necessary than we may realize. I think if we all carried a bubble over our heads with all that we had going on in our lives, we would be astounded at the difficulties in people’s lives. But we aren’t always privy to that. Our recent appointment at Children’s Hospital with our littlest was a stark reminder of all those that are fighting battles much bigger than our own. And that even amidst our fear of surgeries and outcomes, compassion was a gift well worth extending. You never know the battles others are fighting. Comparison happens so easily. I can easily find myself comparing what others have with what I don’t have, what others can afford to what I can’t afford, what others can handle easily that I cannot. And the list goes on. Truth be known. It has never, ever helped me to do that. Not. Once. So it is futile for me to go there. Instead, I choose to see each person’s journey as their own. We all have unique situations and differing circumstances. Each of us has needs and challenges. Some are just more obvious than others might be. Anyone with a social media account has quick and easy access to all sorts of successes. And we can begin to feel inundated with all that others have accomplished, produced, or created. We can start to believe this illusion that others have it all together, don’t have any stresses or hardship, and have a perfect life. But isn’t it refreshing when for a change you see someone admit that they don’t have it all together or that they actually experienced a Pinterest fail? 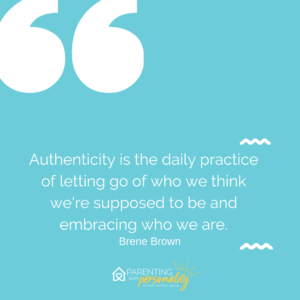 Feel some pressure release when you start to have eyes for others who are authentic about their less-than-perfect lives. Remind yourself that others just don’t post those things as often. I wonder what a different place this world would be if we could let down and be more honest with each other. If we didn’t have to hide behind the illusion of “All is Well” and could actually live with a greater sense of authenticity…being real! I think it would bring a sense of refreshment and renewal, and even respect. I don’t know about you, but I can honestly say I have grown in respect for someone who was willing to share their struggle more often than I have grown in respect because someone portrayed perfection. This can be harder than it sounds. We can all stand back and say we hate drama, but when everything hits the fan, what do you do? It takes some conscious decisions to step back, take a breath, and remind yourself that sometimes our emotions are fueled by hearsay. Sometimes we need to step back and believe the best of others. Other times we need to step up and go to the source. We faced that this week with bullying at school. It breaks our hearts to hear our child be crushed by another child’s words or actions. Sometimes we have to be willing to model going to the source, asking questions, and involving yourself as an agent for calm and peaceful communication. And other times we might need to teach them how to dissolve or resolve the drama brewing around them. Isn’t it nice when parents can have shared goals in this! It seems that drama can race wildly in today’s youth. All too often, peers and even parents can add to the level of drama. I wonder how different things could be if we purposed to calm the drama and embrace peace and model this behavior for and with our kids. This can be ultra-challenging. Just today, we faced this with our teenaged son. Unbeknownst to us, he had a mass growing on his arm for the last couple of months. He just showed us the other day. After visiting the doctor today, we discovered it was a tumor on his bone. They think that it is probably a benign tumor, but will be doing further testing with MRI. It felt quite easy for my thoughts to run away from me. Truth be known, it was quite an exercise to control those thoughts and keep perspective. But we are choosing to just look one step at a time and keep perspective. I’ve often used the analogy of walking with a flashlight. When you want to see where to go in the dark of night you shine it straight down to your next step. If you shine it too far out front, you can easily trip and fall on what’s right in front of you. So I try to remember to keep my flashlight down low and not let it get too far ahead of me. My personality likes to tackle one thing at a time. In fact, the family joke is that several of us can only handle one rock in our tumbler at a time. I don’t necessarily like this about myself, but I can get overwhelmed easily. I can relay a list as long as my leg of things that need done and then tell my husband I need a nap. It makes sense to me…I shut down! But that’s not exactly helpful! At the present time, each of our seven kids has a physical, emotional, or combination of needs that are concerning or need addressed. For some of them it is health related, from something like a blood test to figure out food allergies and horrible eczema to an upcoming skull surgery. For others, they have felt pain, hurt, or disappointment and are trying to gain their momentum. No matter the issue, it is a hard journey on a parent’s heart. And as tempting as it feels to go into hibernation, I will instead think of the next small but doable task to take on for each child. It may not be monumental, it may not even feel significant, but I will continue to find the doable and do it! It might be helpful to note that some personalities handle things opposite of mine. Instead of becoming aware and shutting down, they purpose to become more productive. But either way, it is important to be reasonable and realistic in the next doable step. 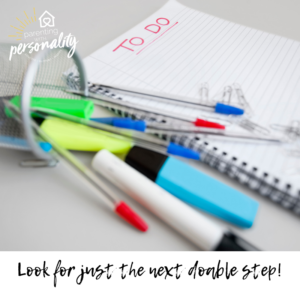 Instead of shutting down or overwhelming yourself with your to-do list, just pick those next small and manageable steps to getting through. I don’t know about you, but it seems like my mothering mind works overtime at night. In the dark of night, I find myself debating the things I wish I had said or done. Or perhaps the things I wish I hadn’t said or hadn’t done. And before I know it, I can get caught up in this muddy mess of feeling guilty. I’ve heard it said before that the reason a car’s rearview mirror is so small is because what lies behind us is so much less important than the windshield and all that is still in front of us. How true is that! We can’t really go back and change things. We can waste a lot of energy and emotion on feeling guilty. But when we focus instead on where to go from here, we don’t get stuck. Looking ahead also helps us see things as a process. We are learning, growing, changing, and doing our best. Let’s give ourselves grace in that! We are doing the best we can. We are doing what we believe to be best. It is important to remember that God will give us what we need to get through it and help us grow through the experience. Maybe you can identify with some of the pitfalls I’ve mentioned. Perhaps you can pick out a couple that trip you up most often. Hopefully, you can slow down and choose what you want to embrace instead. But remember, I promised ten, and this is only six! So be sure to catch this Friday’s part 2 of this blog article to get the rest of the list! Don’t miss out! Here’s a helpful infographic of the Ten Things to Avoid in Tough Seasons of Parenting and What to Embrace Instead! Sign now up for this resource and more free straight to your inbox! Until later this week, I’d like to encourage you to identify one thing you can embrace from this list to help you through the tough times. Which would you choose to focus on…Compassion, Authenticity, Peace, Perspective, The Doable, or Grace? What is one practical way you might step in that direction and avoid the pitfalls that can trip you up? I’d love to hear your comment, so feel free to post your thoughts or ideas in the comments section below. Hugs for you during this difficult season! P.S. Stay tuned for part two on this topic coming up on Friday morning and catch me on the radio Friday as well at 1 pm MDT online or live in Denver on 94.7 The Word KRKS!